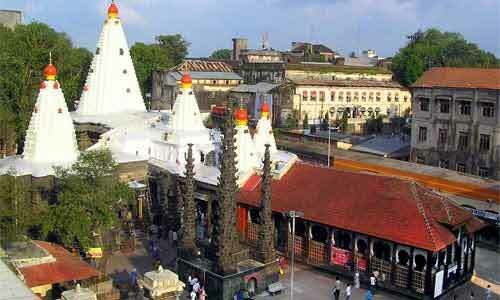 Kolhapur Ambabai or Mahalaxmi is the family deity of thousands of Maharastrian families. Kolhapur Mahalaxmi Temple is located at Kolhapur in Maharashtra. This is ancient Shakti Temple visited by millions of devotees. 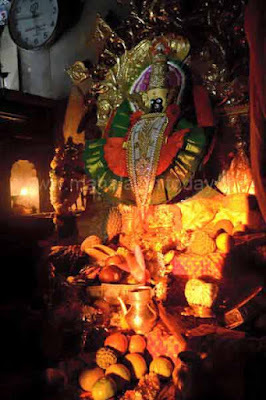 There is a Garuda murti in the front of the temple as Mahalaxmi is the wife of Lord Vishnu. The presence of lion as a vehicle or vahana behind the image and shivling on the head makes her Maa Parvati (Durga) as per some devotees. It is essentially a Shakti Shrine. Maa Laxmi or Parvati (Durga) debate is for scholars (especially for secular scholars). For devotees, She is kind and benign mother who resides in Kolhapur as Ambabai or Mahalaxmi. She protects and nourishes her children. Call her by any name with devotion by following dharma, She will answer. Kolhapur Mahalaxmi is an ancient deity and is referred in Jain texts, Markandeya Purana, Bruhadshesha Ratnakar, Padma Purana and in many copper plate inscriptions, manuscripts and letters. The current form of the temple is credited to Rahstrakuta period or the earlier Silhara rulers of Kolhapur around 8th Century AD. Like thousands of other temples in India, Kolhapur Ambabai Temple was destroyed by Muslim rulers and the murti (idol) of Mahalaxmi had to be hidden by the priests and devotees. The murti was reinstalled between 1715 AD and 1722 AD in the present temple by Sambhaji Maharaj. This may account for the varied construction style of the ornamental and well-carved lower structure and the relatively pain structure of Shikhara. The temple is oriented towards West and the Western gate is the Mahadwar or the main entry to the enclosed temple complex. A traditional Maratha wooden pavilion with wooden ceiling is found on entry from the main gate. The temple has been expanded many times. It contains four main discernible parts. The eastern part consisting of the Gabhara or shrine, the rangamandapa and eastern hall are the earliest parts of the temple. The main murti of Ambabai is placed in the eastern shrine. The other two sanctums are on the north and southern parts of the temple complex. Mahakali is worshipped in the north sanctum and Mahasaraswati is worshipped in south sanctum. The mandapa joining the three shrines is the Maha-Natamandapa or the hall joining the three shrines. The series of five Shikharas create an imposing effect. The offsetted walls are covered with carved instrumentalists, dancers, lady musicians, celestial beings and other common auspicious motifs found in Hindu temples in Maharashtra. The warriors and guardians are other important sculptures here. The wooden mandapa also have arches which are typical of Maratha architecture. The most ancient construction in the temple is in stone masonry without the use of mortar. The old plan is stellar in shape and the orientation is such that the setting sun touches the face of Goddess on Magha Shuddha Panchami – the fifth day during the waxing phase of moon in Magh month (January – February). There several subsidiary deities worshipped in the temple including Ganesha, Vishnu, Seshanai and Dattatreya. There are a number of tanks in the temple like the Manikarnika Jund and Kashi Kund. An important temple festival is observed on Chaitra Purnima day (full moon day in Chaitra Month) (March or April). All the five Shikaras are illuminated with oil lamps on the occasion. The brass image of Goddess Mahalaxmi is carried around the town on a chariot on the day. Tuesdays and Fridays are the most important days in a week in the temple. Palkhi of Goddess is taken out in procession. Jogwa is performed by devotees on Tuesday for desire fulfillment. Other important festivals are Navratri (September – October) and Kojagari Lakshmi Puja on Ashwin Purnima (October).